Ourview | An ungovernable country? On Tuesday, Parliament was adjourned for the sixth time. So far, the winter session has been a washout. And it will surprise few if more days are lost to agitation in the two houses. Outside, Anna Hazare is threatening a fast again. Both in and outside Parliament, the government faces agitation on a slew of issues ranging from black money to foreign direct investment (FDI) in retail to the demand for an “effective" Lokpal. To a foreign observer, it will appear that India is fast turning into an ungovernable country. This impression can be excused. The fact, however, is that the country’s politicians—across the political spectrum—are a desperate lot. The ruling coalition—the United Progressive Alliance (UPA)—suffers from another problem: either it is out of touch with political realities in the country or it could not care less. Both are worrisome. Take the decision on liberalizing FDI in retail. It was taken two days after the winter session commenced on the 22nd of this month. 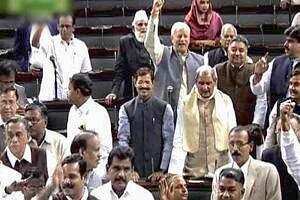 There was turmoil in Parliament right from the start of this session. Clearly, from a tactical perspective, the government made an error in taking a policy decision of this magnitude, one that in hindsight was expected to lead to a great deal of friction. The problem is not that suddenly the country—citizens and leaders—has become an unruly place. The issue is the politicization of almost every aspect of policymaking and the economy. In a fiercely competitive political system, it leads to relatively simple—even technical—issues turning into political problems. From the bailout of airline companies to raising FDI limits to the right fiscal and monetary policy mix, everything becomes fair game for politics. For this, the UPA is to be blamed. It has, over the past two-three years, if not earlier, politicized decision-making to a great deal. That is at the root of the current mess.